In blender container, place preserves and jalapeños; blend until almost smooth. Set aside. In medium bowl, combine bread crumbs, pecans, cayenne pepper, onion powder, garlic powder, celery salt, cinnamon, turmeric, salt and butter; mix well. Set aside. Heat oven to 350°F. Unroll dough sheet; press into 12x8-inch rectangle. Cut into 24 squares. Press 1 square in each of 24 ungreased mini muffin cups. Firmly press in bottom and up sides of cups, letting points of dough extend over edges of cups; brush points with beaten egg. Spoon 1 teaspoon cream cheese spread into each cup; top with 1/2 teaspoon cherry preserves mixture. 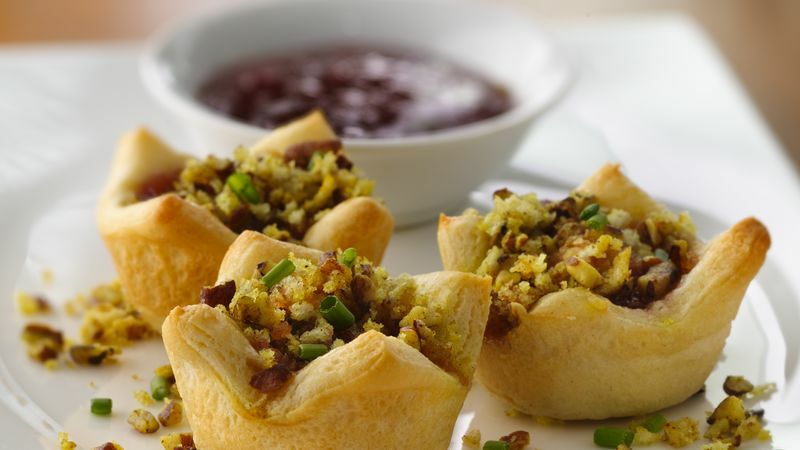 Sprinkle each tartlet with 1 teaspoon of the bread crumb mixture. Bake 11 to 16 minutes or until golden brown. Cool in pans 5 minutes. Meanwhile, in 8-inch skillet, cook remaining bread crumb mixture over low heat 4 to 6 minutes, stirring frequently, or until golden brown. *To serve tartlets individually, top each with 1 teaspoon remaining preserve mixture and 1/2 teaspoon toasted bread crumb mixture.